Clusters of live Bathymodiolus mussels (left side, foreground, and background) like these were encountered by D2 on both the July 11 and July 12 dives at seep sites south of Nantucket. White cottony coating on some of the mussel shells is from bacteria. Laser dots are 10 centimeters apart. Image courtesy of the NOAA Office of Ocean Exploration and Research. Download larger version (jpg, 1.4 MB). On July 11 and July 12, 2013, NOAA Ship Okeanos Explorer and the Deep Discoverer (D2) remotely operated vehicle (ROV) targeted seafloor sites located about 165 kilometers south of the island of Nantucket. These dives were the first scientific explorations of newly discovered seeps lying at approximate water depths of 1,100 meters (July 11) and 1,400 meters (July 12). For each of the dives, D2 targeted four sites located at the base of water column bubble plumes on small ridges overlooking unnamed canyons. The red and yellow symbols respectively mark the locations of the July 11 and July 12, 2013, Okeanos Explorer and D2 explorations of the seafloor at cold seeps south of Nantucket. Image courtesy of the NOAA Office of Ocean Exploration and Research. Download image (jpg, 61.4 KB). In late 2012 and again during the current expedition, NOAA scientists aboard the Okeanos Explorer used sonar mounted on the ship’s hull to detect plumes of methane bubbles emanating from the seafloor near these canyons. The bubble plumes rise hundreds of meters into the water column and are diagnostic of the emission of gas from the seafloor at cold seeps. Throughout each dive, scientists used seafloor observations to guide the ROV along the trackline most likely to intersect evidence of cold seeps. For example, bacterial mats and certain mussel species rely on methane or hydrogen sulfide to survive, and their presence is a strong indicator of seafloor seepage. Some carbonate minerals that form due to microbial processing of methane are also good seep indicators. Unlike hydrothermal vents, which occur at the edges of tectonic plates where new seafloor is formed in fiery processes, cold seeps lie within plates and leak fluids and gases that are at or close to ambient deep-sea water temperatures. Cold seeps can form above geologic faults or salt deposits or at places where canyons cut into sediments that trap fluid and gas. 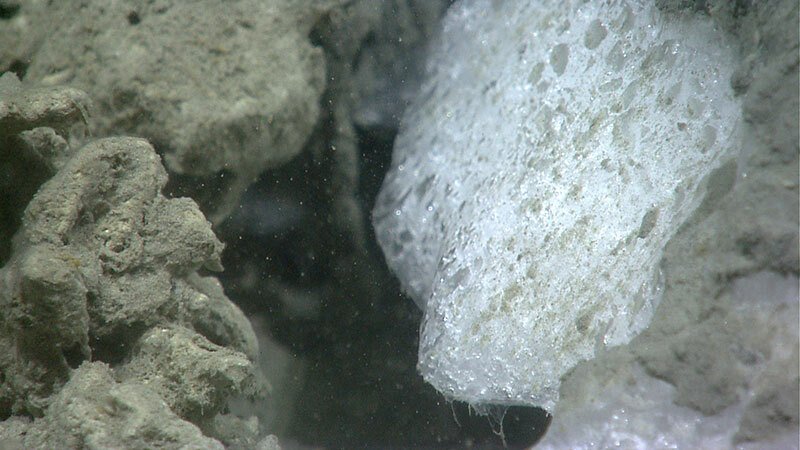 Some cold seeps develop where warm ocean water causes special methane-containing deposits (gas hydrates) to release their gas. 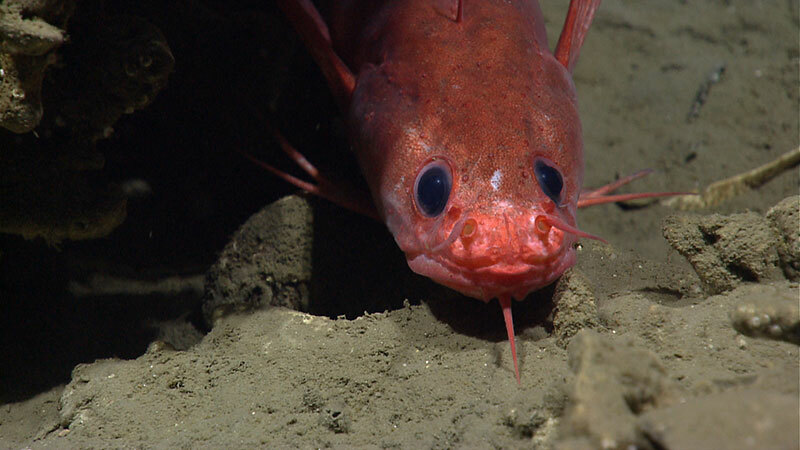 Like hydrothermal vents, cold seeps often host special biological communities that use chemical, not photosynthetic, processes to derive their energy. Several different fish species, including this Gaidropsarus peaking out from under a carbonate rock, were observed on the two seep dives. Image courtesy of the NOAA Office of Ocean Exploration and Research. Download larger version (jpg, 1.2 MB). From the start of Dive 03 on July 11, D2 encountered red crabs, anemones, and ample burrows, indicating that the soft sediment bottom was a good habitat for some marine organisms. Large (several centimeters wide), single-celled organisms called xenophyophores were observed on the seafloor, and fish encountered during the dive included eelpouts, rattails, flounders, and a shark. Most of the dive traversed seafloor that was sparsely littered with the debris of dead mussels and sporadic clam shells, which provided clues of nearby seep communities. Occasionally we observed small clusters of living Bathymodiolus mussels and patches of filamentous bacteria. Only near the end of the dive did scientists find a large bed of live mussels about 90 meters east of the location of a water column bubble plume that had been detected in late 2012. 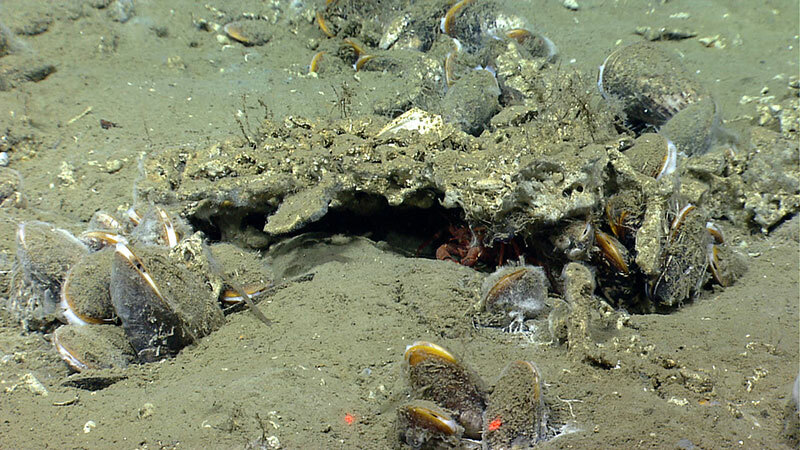 Throughout the dive, brown chunks of carbonate, some clearly containing fossil shells, lay strewn on the seafloor, and massive in-place carbonates were discovered at the site of the live mussel beds. These carbonates imply that seepage has probably been long-lived. Massive carbonates (brown rocks), live and dead mussels, and white bacterial mats were found at a seep site explored by D2 on July 11, 2013. Image courtesy of the NOAA Office of Ocean Exploration and Research. Download larger version (jpg, 1.6 MB). During Dive 04 on July 12, D2 descended through a water column plankton swarm to find numerous clusters of four to 20 mussels within minutes of reaching the seafloor. 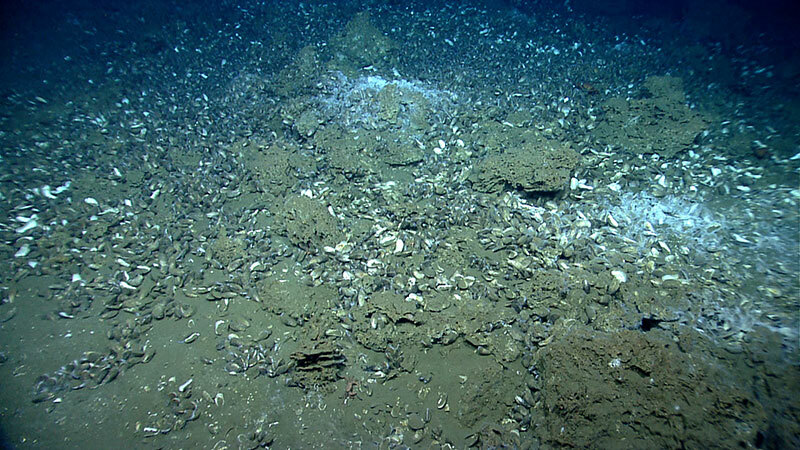 This distribution of mussels is common at other seeps and may indicate diffuse leakage of methane and fluids from the seafloor over a widespread area. As the D2 exploration progressed, extensive mussel beds were discovered at the base of the water column bubbles plumes. Scale worms and urchins that are often associated with cold seep communities were not observed living among the live mussels at this site. White and gray bacterial mats were much more widespread than the mussels, occurring both proximal to the mussels and in the surrounding areas. On this dive, carbonate was less abundant. The depths and bottom water temperatures at the dive sites place the locations well within the pressure-temperature conditions at which methane hydrate could form, and seafloor methane hydrate was observed on both dives. Methane hydrate is a naturally occurring, ice-like form of methane and water often found in sediments tens to hundreds of meters beneath the seafloor at locations where the water depth exceeds about 500 meters. Gas hydrate can also form on the seafloor above gas seeps. Seafloor gas hydrates, which are common in the Gulf of Mexico, were observed on the July 11 and July 12 northern U.S. Atlantic margin dives in small accumulations. These observations mark the first time seafloor gas hydrate had been seen on the U.S. Atlantic margin since 2001, when DSV Alvin videotaped gas hydrate forming at 2,000 meters water depth on the Blake Ridge seep, offshore South Carolina. Gas hydrates found at the seafloor on July 11 and July 12 had different forms. Here, a small piece of massive gas hydrate formed above leaking methane. Image courtesy of the NOAA Office of Ocean Exploration and Research. Download larger version (jpg, 1.4 MB). Gas hydrate is a highly-concentrated form of methane. Globally, sediment-hosted gas hydrates store huge amounts of methane and prevent it from interacting with the rest of the Earth’s carbon cycle. Scientists study methane hydrates as a potential natural gas source to meet future energy needs and for their potential role in releasing methane—a potent greenhouse gas—to the atmosphere during climate change events. The small amount of gas hydrate on the seafloor at these dive sites does not have significance for energy resources. The seeps explored by D2 on July 11 and 12 are located in deep waters where ocean temperatures remain stable over long periods, and ocean temperatures would have to warm by 6.5 to 11 degrees Celsius for the gas hydrates to become unstable at these sites. There is no evidence that contemporary climate change plays a role in the formation of these deepwater seeps, some of which appear to be long-lived. 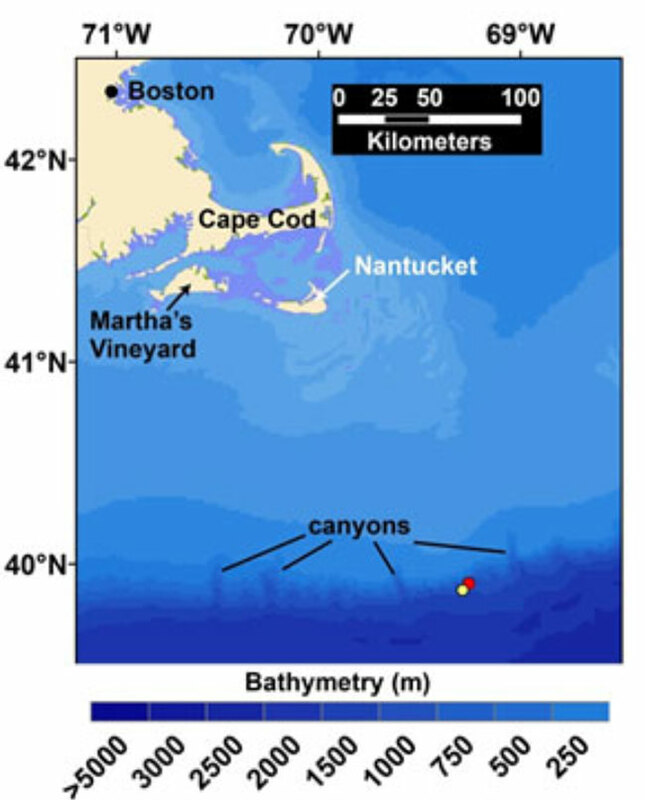 Methane seeping from the seafloor at these sites also does not directly enter the atmosphere. Instead, most of it dissolves in the water column, where it is usually converted to carbon dioxide by microbes. White gas hydrate formed under a rock overhang. 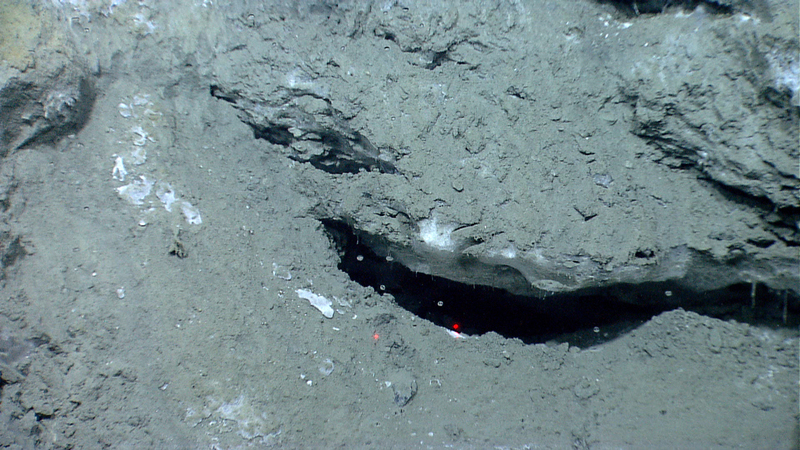 Bubbles being emitted from the seafloor are visible in the shadow below the rock. Laser scale denotes 10 centimeters. Image courtesy of the NOAA Office of Ocean Exploration and Research. Download larger version (jpg, 1.5 MB).